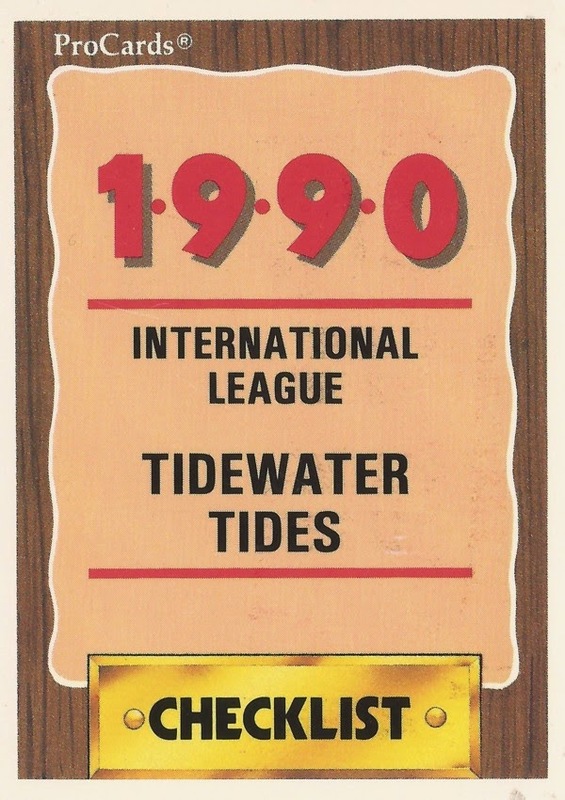 Features on each member of the 1990 Tidewater Tides, AAA affiliate of the New York Mets. Players are as included in that year's team set. Click on the player's name to read more. 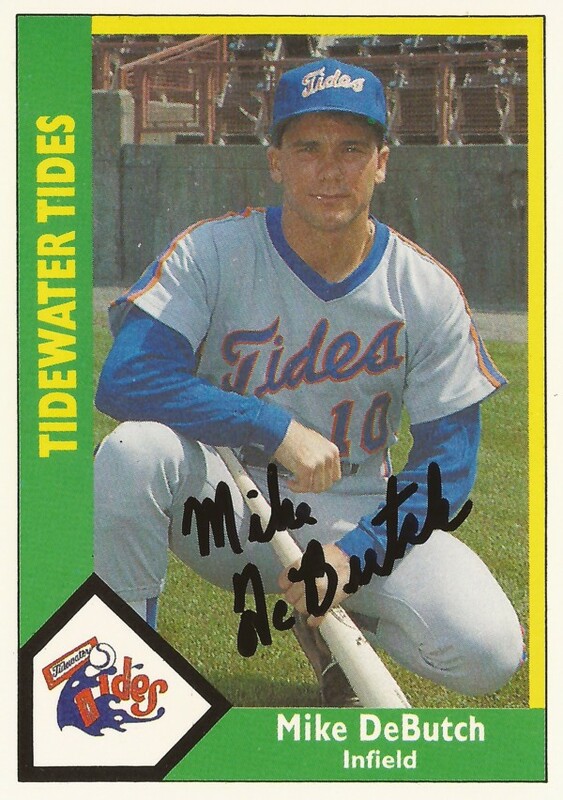 Traded mid-season, Mike DeButch saw it as a new opportunity to make the majors. Cesar Mejia threw a no-hitter at AA. He later was a long-time instructor in his native Dominican Republic. Orlando Mercado got his first hit, a grand slam. An umpire let him know he could slow down. Dale Plummer made it back from cancer to get called up to majors. Kelvin Torve began to doubt whether he'd make it to the majors. And then he made it. Shawn Barton finally made the majors. He later made it his mission to stay. Tim Bogar saw himself as the guy who was never noticed, but was still needed. Kevin Brown seemed to have good poise. He used it in parts of three major league seasons. Rocky Childress wanted another shot at the majors for 1992, after four previous seasons in bigs. John Cumberland was comfortable pitching in six major league seasons. He later had a long career as a coach. Mike DeButch didn't complain with an extended AAA stay. He just didn't make the bigs. Carlos Diaz was itching to start after college. He made the majors for nine games. Jeff Gardner's major league debut was as good as they said it would be. He played in major league seasons. Brian Givens eventually made the majors - in his 12th season of pro ball. Denny Gonzalez got intentionally walked in his major league debut. He played in five seasons. 11 - Manny Hernandez, Few Minutes: Manny Hernandez was happy to be in the majors. He'd waited a while to get there. Keith Hughes got his first major league hit in 1987, it led to a Phillies win. He played in four major league seasons. Jeff Innis played seven major league seasons, all with the Mets. He tried to get an eighth with a knuckleball, but it didn't work. Chris Jelic made the Mets in 1990. He got his first league hit, a home run. It also turned out to be his last major league hit. Scott Lawrenson worked his way up from rookie ball to the majors, as a trainer. Dave Liddell singled in his first major league at bat and in his last. They were the same hit. Cesar Mejia got a no-hitter at AA in 1988, but he never got chance to play in the majors. Orlando Mercado's first major league hit was a home run - a grand slam. Rich Miller knows what it's like being in the minors. He's been there for three decades. Scott Nielsen proved he could pitch. He did so in the majors in four seasons. Dale Plummer had a close call with the majors, and scary close call with cancer. Darren Reed to make the majors after his 1991 spring trade to the Expos. He was soon out for the year with an injury. Roger Samuels knew it was a matter of getting opportunities. He got major league ones in two seasons. Zoilo Sanchez hit 15 home runs one year. He made it to AAA, but never made the majors. Ray Soff waited since he was 7 for his first major league win. He got it in 1986. Steve Swisher knew players had to work to be successful. He taught that to players, and his son. Lou Thornton played parts of five major league seasons. He then came back to try for one more. 28 - Kelvin Torve, Sure Situations: Kelvin Torve's first major league at bat came with a chance to win the game against a Hall of Famer. He struck out. When Dave Trautwein had no one to throw to, he threw at a brick wall. He played six seasons, never made the majors. Julio Valera was nervous in his Angels debut. He came from the Mets and later played for the Royals.